When we last heard from AFS Intercultural Programs, they were offering the results of a global survey of 13-to-18-year-olds (also know as “Generation Z”). In contrast, the latest research effort from AFS focuses again on Generation Z respondents, but this time entirely from Indonesia. An online survey fielded in March and April of this year gathered more than 5,500 responses from young Indonesian students, and it provides some interesting insights on one of the world’s most significant emerging markets. Indonesia is the fourth most-populous country in the world, and half its citizens are under the age of 30. The middle class is expected to double in size (from 74 million to 141 million) by 2020. Currently among the world’s top 20 economies, Indonesia is trying to break into the top 10 by 2030. It is a member of ASEAN, a political and economic group of 10 Southeast Asian countries whose economic growth and large college-aged populations have them firmly on the radar of international educators the world over. 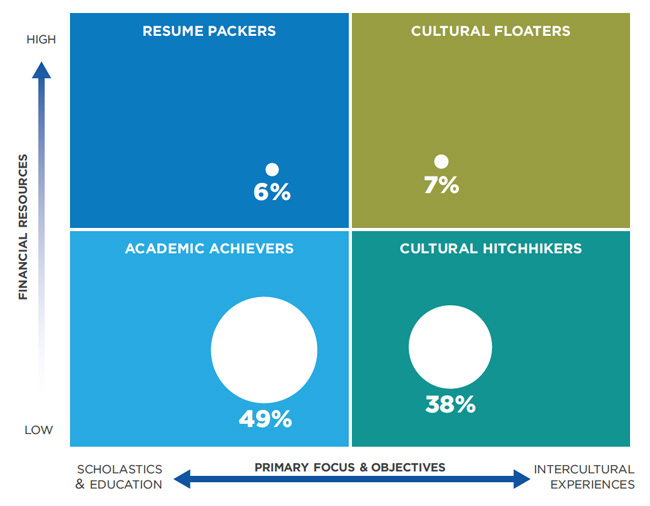 AFS found that just over eight in ten (81%) of the respondents had considered study abroad. Whereas the earlier global survey found that younger students are mainly motivated to study abroad by an interest in cultural exploration, the AFS survey for Indonesia observed a distinct orientation toward academic goals. As the following chart reflects, a majority of young Indonesians are drawn to study abroad out of an interest in pursuing a high quality education overseas and at a reputable institution. The longer-term goal of such students is to boost their academic profile with a study experience abroad, and, eventually, to open the door to better career prospects. Compared to the earlier global sample for AFS, Indonesian students demonstrated relatively few concerns about study abroad. However, personal safety and security issues rated as the top area of concern (cited by 47% of respondents), trailed slightly behind by a fear of homesickness (46%). This finding echoes earlier observations, including those from an ICEF Monitor of Indonesian education agencies earlier this year, that point to the importance of family and community culture in Indonesia. This means in part that, when considering study options abroad, parents will look for every assurance that their children will be well cared for and safe. Taking that one step further, Indonesian parents see themselves as stakeholders in their children’s education. At the least, this means that recruiters are well advised to emphasise student support services, security, and other community supports at their institutions. Some schools have gone so far as to set up special family services with Indonesian parents in mind, offering newsletters and invitations to school events in the home country to encourage a sense of participation and connection and, needless to say, positive word of mouth among parents. In this sense, support services can take an even broader cast within the Indonesian market, addressing not only the needs of the students but also of their families. Beyond any such concerns around personal safety, affordability also comes through loud and clear as an important obstacle to study abroad for younger Indonesians. Nearly half (45%) indicated that they would not be able to pursue study abroad without scholarship support. And most respondents demonstrated some price sensitivity to the extent that issues around affordability would figure prominently in their selection of a study destination or institution abroad. Not surprisingly, price also figures as well in the principal decision factors for students when planning for study abroad. The most important aspect for many students (84%, in fact) was the reputation of the host country. This was followed by price (80%), the opportunity of English-medium instruction (78%), and the reputation of the host institution (71%). This entry was posted in Asia, Indonesia, Most Popular, Regions, Research and tagged student enrolment, Indonesia, postgraduate student recruitment, undergraduate student recruitment, student recruitment.